I think that many of us remember receiving Valentine's Day cards in grade school. We would sit with our little bag waiting in anticipation for our friends to put that special card in the bag. Each car was a token of friendship and made you feel special. 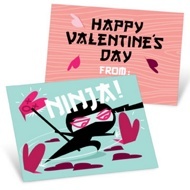 Now that we are older, I still like getting a card or two on Valentine's Day. Granted, these cards are a little different. Ones from my kids are carefully crafted with favorite colors and a special picture. Most importantly the meaning that I am special to them, just like those first Valentine's Day, is what I treasure. With Valentine's Day about a month away, it is time to think about creating a special Valentine's Day card to give to family, friends and even your kids' classmates. Pear Tree Greetings is an online greeting card company offering unique designs printed on premium, 100 lb. card stock made from 100% post consumer recycled paper for any budget. Pear Tree Greetings offers a wide variety of cards that can fit almost any situation. Personally, I love the classroom valentines. There are so many options that I often find it difficult to choose. This year I'm letting my kids decide on the perfect fit. My one child choose the Ninja style while the other one choose the Mustache Props. He thought it was funny to add a mustache to his favorite swim picture. I really like how you can personal these cards with pictures. It makes your card stand out from the crowd. Plus the price is great. Starting at $0.32 a card, you can't beat that price for a personalized card. Would you like to have some Pear Tree Greetings Valentine's Cards to send? I have a $25 gift certificate to give one of my readers. Please use the Rafflecopter to enter. Make you Valentine's Day card as unique as you with a card from Pear Tree Greetings. Disclosure: I received a gift certificate to use and one to giveaway. All opinions are my own. I love sending personalized cards. Thanks for this giveaway. I looked through all those cards on the site, and they are SOOO cute!!! Thanks for a great giveaway!! "Whooo's Your Valentine?" and many others! I like the Flowered to Perfection design. My son would love the Plane Cool and my daughter would love the Owl Be! the kids frog finger puppet is cute, thanks! the cutie pie Ribbon strand is adorable! I love the Valentine Candy Cards -- Stylish Mustache! Thanks for the giveaway! Love Flowered to Perfection cards with photo inside the flower. I like the Caterpillar Finger Puppet.